I'm flattered to have received a Super Swe-e-e-e-t Award from Jeanette Anderson http://jeanettesandersen.blogspot.com/ on September 20 (sorry for the delay in getting this up Jeanette but it is greatly appreciated)! Her mission is to make people laugh, cry, shout, smile, frown and just enjoy reading so check out her blog and see if it works! First: I must thank the person who nominated me... of course, that's the proper thing to do! Thanks Jeanette! Second: Answer the Super Sweet Questions (that follow below). Third: Nominate a baker's dozen (13) to receive this award (if you can't find 13 that's okay... just find as many as you can). 1. Cookies or Cake? Cookies. Especially my mother-in-law's special oatmeal cookies! Even tastier when eaten at the cottage. 2. Chocolate or Vanilla? Vanilla, with lots of fresh berries. 3. What is your favorite sweet treat? I really don't have a sweet tooth... I know, ironic considering the nature of this award, right? But, if I had to choose it would be Godiva Chocolates. 5. If you had a sweet nickname, what would it be? My dad called me Annie Bananie (does that count)? It's my pleasure!!! 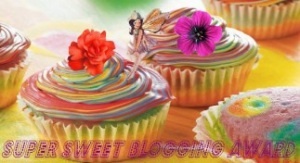 Love your blog, appreciate your support and wish you lots and lots of followers. It appears that self-publishing is the wave of the future! I find it difficult to wrap my head around because it's a fairly new way to go about publishing, but it really seems to be gaining the respect it deserves amongst the writing community. I self-published a collection of non-fiction and poetry, and I don't regret it for a minute! Thanks for the great read, and for opening my eyes up to National Novel Writing Month--it may be the perfect incentive I need to get me through the last 75 pages of my novel. Most of all, I am encouraged that my life has touched yours in a positive way. You have touched mine as well. We have shared the sweetness of fellowship with one another. I am grateful. Thank you Anne! Courtney... glad to hear you've been inspired. If you do decide to do NaNoWriMo look me up on the site and connect. I plan to do it again this year too! Shirley, you have indeed touched my life. Thank you! What a wonderful surprise, Anne, thank you very much. Fun questions and such a good opportunity to recognize fellow bloggers. I'm honored to be part of your Baker's Dozen any day! Congratulations!! I think you deserve it!